Seoul/New Delhi: India and South Korea agreed with the US on the outline of deals that would allow them to keep importing some Iranian oil, according to Asian officials with knowledge of the matter. No final decision has been made and an announcement is unlikely before US sanctions on Iran are reimposed 5 November, the officials said, asking not to be identified because the information is confidential. That opens the possibility that the terms could still be modified or the deals scrapped entirely. The waivers would ensure at least some Iranian oil continues to flow to the global market, potentially calming fears of a supply crunch and further suppressing international oil prices just before mid-term elections in the US Brent crude has fallen 14% from over $85 a barrel last month on signs that other OPEC producers will pump more to offset any supply gap. Almost all buyers have been negotiating with the US for waivers. That was after President Donald Trump in May withdrew from a nuclear agreement with Tehran hammered out by his predecessor, Barack Obama, and said he would reimpose economic curbs lifted under that 2015 accord. While the waivers would signal an easing of Washington’s hard-line stance that buyers cut purchases to zero, the limiting of payments to an escrow account would mean the US can maintain economic pressure on Iran by squeezing a critical source of its revenue. The US State Department on Wednesday referred to comments by spokesman Robert Palladino at a press briefing on Tuesday that while the goal of the US remains to get buyers to cut Iranian oil purchases to zero, it’s prepared to work with countries that are reducing their imports on a case-by-case basis. When asked which countries were being considered for granting waivers, Palladino said there was “nothing to announce today". Several countries “may not be able to go all the way to zero" right away on purchases of Iranian oil after US sanctions take effect, White House National Security Adviser John Bolton said on Wednesday at an event in Washington. A waiver would allow companies to buy limited volumes of Iranian oil without running the risk of being shut out of the US financial system. In India, it would provide some relief by allowing the purchase of relatively cheap crude as the government faces protests over higher fuel costs before national elections next year. 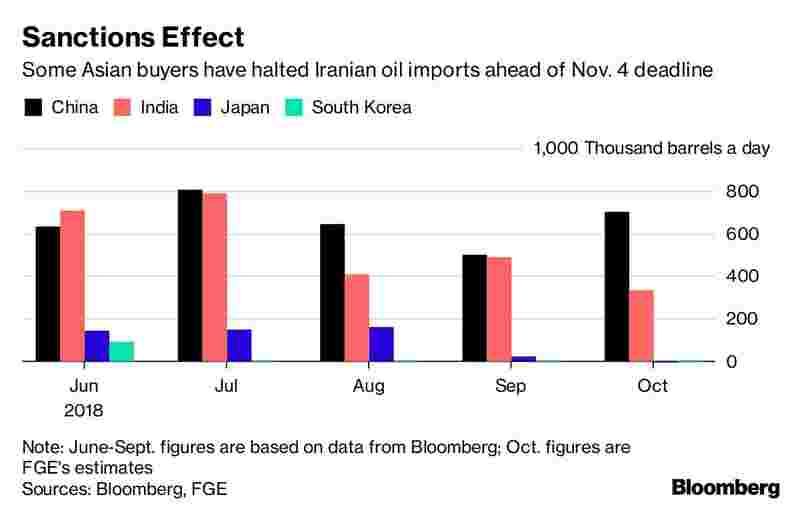 And for South Korea, a US exemption would mean a resumption in imports of the Persian Gulf state’s South Pars condensate, a type of ultra-light oil that is particularly critical for the Asian nation because many of its plants are geared to process it. Other Asian countries such as Japan have also since halted imports from Iran before the US sanctions kick in. The Chinese government is said to have told some state-owned companies to avoid purchases.